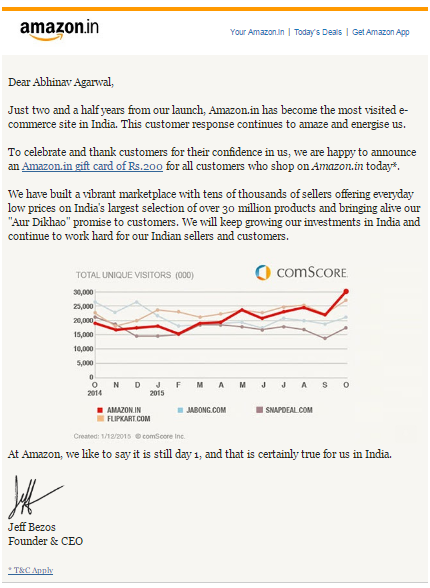 Abhinav's Tech Blog: Amazon Launches Prime in India. Can Flipkart Stay ‘First’? This is a significant, though not unexpected, step by Amazon India in its battle to gain primacy in the Indian e-commerce space. In Dec 2015, it announced that it had become the “most visited e-commerce site in India”, and offered a gift card worth ₹200 for customers (with some terms and conditions). It was also in some ways a sleight of hand since it did not include visitors via mobile apps. That also changed in July 2016 when an app data tracker stated that Amazon had become the most downloaded app on the Google and Apple app stores in India. 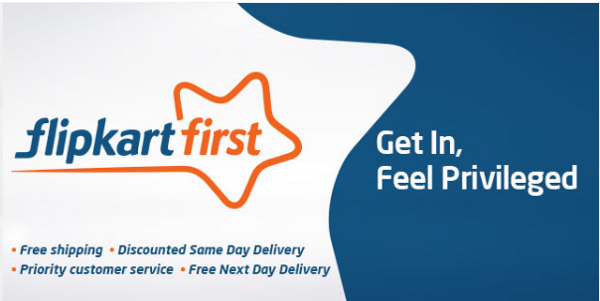 Flipkart had launched its version of Amazon Prime in May 2014. Called “Flipkart First”, it also was available for an annual price of ₹500. But for reasons best known to Flipkart, after an initial flurry of promotion and advertising, including a three-month giveaway to 75000 customers, Flipkart did not seem to pursue it with any sort of vigor. Customers complained of many products being excluded from Flipkart First, and in the absence of any sustained campaign to make customers aware of the programme, it has slowly faded from memory. Flipkart also has not shared any numbers in some time about the subscriber base and growth of Flipkart First. Worse, there was a news story on July 20th about Flipkart planning to launch a programme called “F-Assured”, as a replacement to Flipkart Advantage. The story suggested that the launch of F-Assured was also meant to “preempts the launch of Amazon Prime” — something that did not come to pass. Unlike Prime, which Amazon founder Jeff Bezos called one of the three bold bets Amazon had made (“AWS, Marketplace and Prime are all examples of bold bets at Amazon that worked” — is what Bezos wrote in a letter to shareholders), Flipkart has let First become yet one of many initiatives it has launched and failed to pursue with any meaningful degree of commitment or focus. Flipkart launched its e-book store, Flyte, in November 2012, almost a year before Amazon launched operations in India and more than a year before Amazon launched Kindle in India. Yet, Flipkart shuttered its e-book store in late 2015, citing e-books as not “a strategic fit.” The same was the story with its digital music business, which it started in 2012, and shuttered in June 2013. I had written more than a year back that Flipkart seemed to be losing focus, that it needed to beware of Amazon, who I called “The Whispering Death” (an allusion to the great West Indian fast bowler, Michael Holding), and even suggested what it needed to do. Cloud computing was one advice. 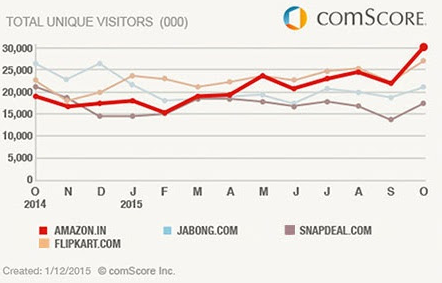 Flipkart continues to lose in its battle against Amazon. It has suffered a steep erosion in its valuations, Amazon is gaining market share faster than Flipkart, and now even the battle of perceptions is being won by Amazon. Flipkart seems to have fallen into a predictable pattern of making a series of flashy announcements, and not following up to make any of them a success. After publishing this, later that day came news that Flipkart-owned fashion e-tailer Myntra had agreed to buy Jabong in an all-cash deal for $70 million. Jabong had been valued at over $500 million in 2013. Flipkart seems to be in the thought mode that it can fight off Amazon by retreating to a few select niches like fashion e-tailing that will give it some sort of a competitive advantage over the US behemoth. This is in many ways a reaffirmation of Flipkart’s “retreat” mentality, since they have retreated from e-books and digital music already. Amazon, on the other hand, believes in getting into every single segment that a customer spends money on. Witness its move into the office supplies market in the US, or into the home services market (estimated at between $400 billion to $800 billion a year in the US). Valuations mean little or nothing for non-listed companies. Jabong was valued at over $500 million in 2013; it was seeking to sell itself to Amazon India for $1 billion in 2014, could not find buyers even at $100 million earlier in 2016, and finally sold itself for 7 percent of its asking price. Flipkart would do well to understand the implications of valuations for itself. Denialism is not a strategy. Flipkart has been in the news for all the wrong reasons — for its penchant of helicoptering executives from Silicon Valley at million-dollar salaries, for high-profile executives, for valuation missteps, and more. Missing in all this is a laser-like focus on execution. If it wants to learn anything from Amazon, it should be this. I first published this post on Medium on Jul 26, 2016. This was later republished in Swarajya on July 28, 2016.